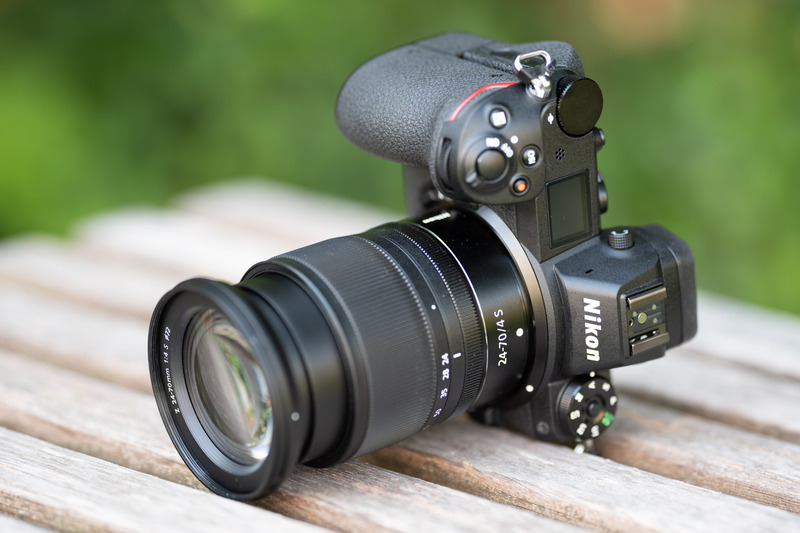 The Nikon Z 24-70mm f4S is a no-brainer for owners of Z-series mirrorless bodies: optically it is as good as the renowned 24-70mm f2.8E VR with a one stop advantage in image stabilization and almost no loCA. 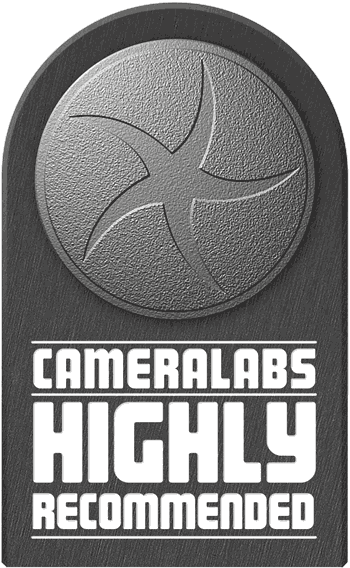 It also delivers very usable close-up performance and retains its high contrast even in contra-light situations. Plus by being roughly half the size and weight it's much more portable and a perfect match for the compact Z-series bodies it's designed for. The new Z Nikkor also focuses as fast and reliably and is sealed as thoroughly as the 24-70mm f2.8E VR. The only drawback of the Z 24-70mm f4S is its relatively ordinary f4.0 focal ratio, but that's easily compensated for by the relatively low price - and did I mention the small size and weight?. So if you're getting a new Z body, be sure to bag yourself this excellent zoom in a kit bundle: Highly Recommended! Check prices on the Nikon Z 24-70mm f4S at Amazon, B&H, Adorama, or Wex. Alternatively get yourself a copy of my In Camera book or treat me to a coffee! Thanks! The Nikon Z 24-70mm f4S is a small and light non-stabilized standard zoom lens with a constant f4.0 focal ratio that’s designed for Nikon’s new Z-mount full-frame cameras. 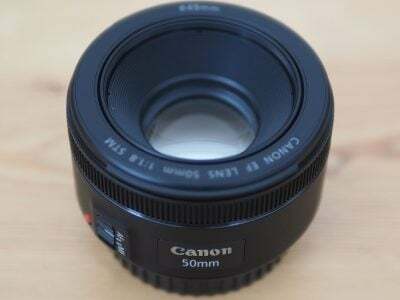 Announced in August 2018 it joins the Z 35mm f1.8S as the first Z-series lenses on the market; the Z 50mm f1.8S will be the third at end of 2018. 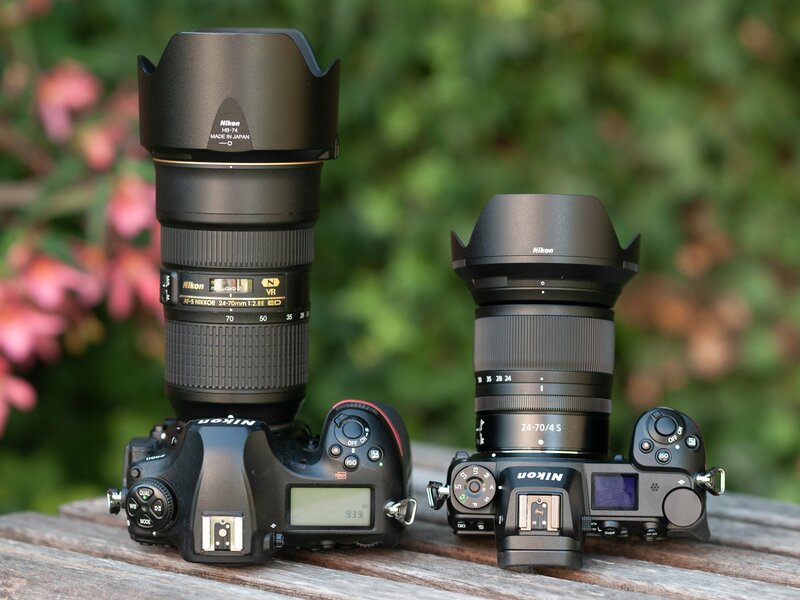 Nikon’s Z-lenses may be the only models currently available with a native Z-mount but thanks to Nikon’s FTZ adapter, existing F-mount lenses can easily be used on their new Z bodies. So the new Z 24-70mm f4S faces competition from other standard zooms with the F-mount, most notably Nikon’s own AF-S 24-70mm f2.8E VR which is the benchmark of 24-70mm zoom for Nikon cameras. As the Z 24-70mm f4S is a member of Nikon’s high-end “S” line it is expected to perform on a very high level. That said, Nikon is pricing it competitively at 1099 EUR when bought alone, or a bargain 600 EUR when bought in a kit with a Z body. Compare this to the 2150 EUR for the AF-S 24-70mm f2.8E VR. This can in part be explained by the one stop slower focal ratio of the new Z lens and its lack of optical stabilization (deemed unnecessary here as it’s built into the Z bodies), but it still represents good value, particularly in a kit. Side note: with a focal ratio of f4.0 it is the only available 24-70mm f4 zoom for Nikon full-frame bodies – and easily the smallest and lightest, playing to the strengths of Nikon’s new mirrorless Z system. To find out whether the new Nikon Z 24-70mm f4S rightfully carries the “S” moniker I tested it on the 46MP Z7 body against Nikon’s own 24-70mm f2.8E VR which is my current reference 24-70mm lens shot on the 46MP D850. So if you’re interested in how Nikon’s brand new system performs, you’ve come to the right place! As usual I’ll have a look at the technical data of the new Nikon Z 24-70mm f4S first. I’ve rated the features with a [+] (or [++]), when it’s better than average or even state of the art, a  if it’s standard or just average, and [-] if there’s a disadvantage. For comparison I use the Nikon 24-70mm f2.8E VR. The score in the “features-department” is 0[-]/2/11[+]. 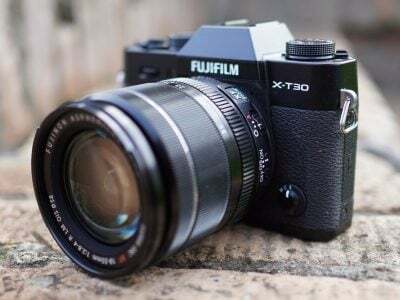 So the lens has a very good feature set – if you accept its focal ratio of f4.0. But that certainly is the enabler to make the lens much smaller and lighter than the alternatives. It offers the nifty feature of the multi-purpose control ring and is sealed against the weather like its bigger sibling, the professional grade Nikon 24-70mm f2-8E VR. And surprisingly for a member of Nikon’s new “S”-line it also comes at a very good price if you simply buy it in a kit with the new Nikon Z7 body. Nikon has the AF-S 24-70mm f2.8E ED VR from 2015 for 2150 EUR / 2400 USD. For more information see my Nikon 24-70mm f2.8E VR review where it got a Highly Recommended. You can still get the older AF-S 24-70mm f2.8G ED version from 2007 which is not stabilized and sells for 1700 EUR / 1800 USD which came Highly Recommended tested on a 36MP D800 in my Nikon 24-70mm f2.8G ED review. Sigma offers the stabilized Sigma 24-70mm f2.8 DG OS HSM Art (1230 EUR / 1300 USD). 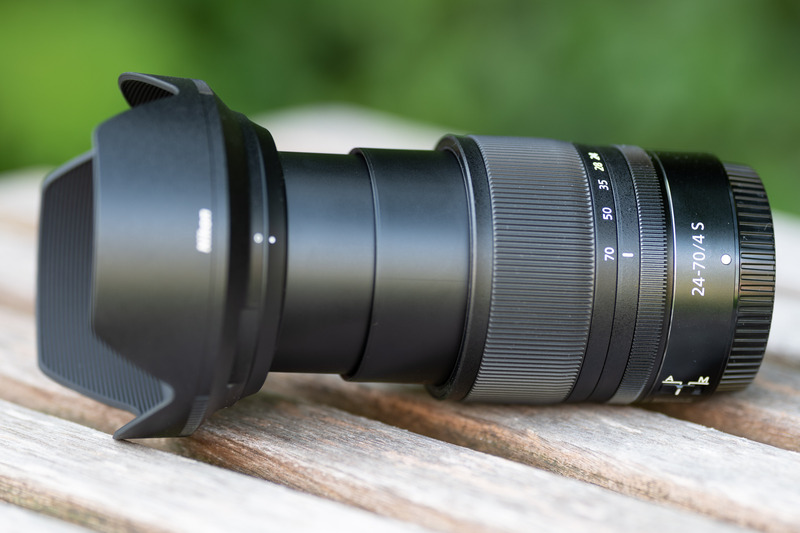 See my Sigma 24-70mm f2.8 Art review where it earned a recommendation. Tamron’s latest model is the stabilized SP AF 24-70mm 2.8 Di VC USD G2 for about 1150 EUR / 1200 USD. It earned a Recommended in my Tamron SP 24-70mm f2.8 VC G2 review. Tokina offers the AT-X Pro 24-70mm 2.8 FX from 2015 (900 EUR / 850 USD) which lacks built-in stabilization. But mounting it via FTZ adapter stabilizes pitch, yaw and roll through the Z7. Focus accuracy and repeatability is critical to consistently produce sharp shots. Repeatability (the accuracy of focus on the same subject after repeated focus-acquisition) of this lens at 70mm focal length is very good (measured 99.1% in Reikan FoCal) with no outliers over a series of 40 shots. There is no focus variation whether the lens focuses from a closer distance or from infinity and I didn’t detect any hunting. At 70mm focal length the lens focuses in around 0.35 sec from infinity to 0.8m (1:10 magnification), which is as fast as the very fast AF-S 24-70mm f2.8E ED VR on a D850 or a Z7 (via FTZ adapter). The zoom ring turns through 55 degrees the way Nikon users are used to and has a 28mm wide rubber surface with a good grip. It turns pretty stiff and can hardly be operated with one finger. The focus/control ring is only 8mm wide and is located closer to the camera. It has no rubberized surface but moves super smooth and can easily be operated even with your pinky. 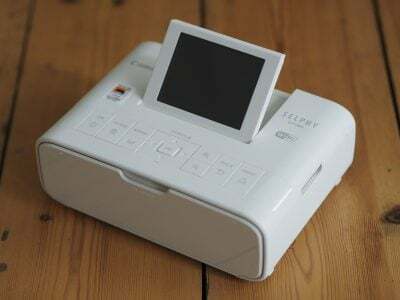 AF-operation of the new lens and image stabilization of the Z7 is inaudible from the outside. If you record video with the built-in microphone the AF-drive produces only a very slight noise. Plus you can control the aperture smoothly and without noise from the control ring on the lens. This is the quietest AF/IS/aperture operation I’ve ever encountered on a Nikon body so far. Mount the Nikon 24-70mm f2.8E VR via the FTZ adapter and you notice a huge difference in noise. As you pull focus, you’ll notice some focus breathing: the image becomes less magnified at closer focusing distances. When I adjusted the focus from infinity to 0.8m on the new Nikon at 70mm focal length, I measured a 2% decrease in magnification. The same test at 24mm focal length did not produce any visible focus breathing. Very good! 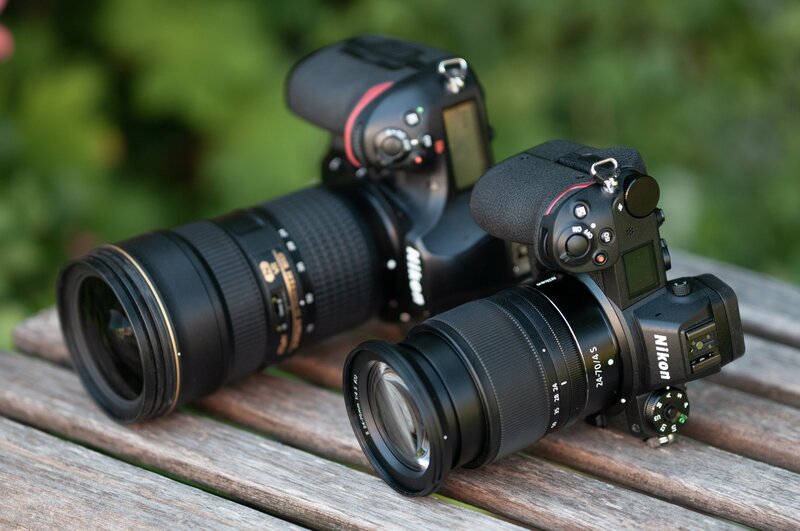 The Nikon 24-70mm f2.8E VR in comparison shows a 1.4% increase in magnification at 70mm focal length, while decreasing magnification by 2.6% at 24mm focal length. So both these lenses produce very little focus breathing when recording video. To test the effectiveness of the image stabilization with the Nikon Z 24-70mm f4S on a Z7 body, I did a series of 140 test-shots hand-held at 70mm focal length. I tested with shutter speeds from 1/80 of a second down to 0.4 sec. Shots at 1/80 sec with VR=OFF are used as reference of how good my hand-holding was at the time of the test and Reikan FoCal did the chore of evaluating the sharpness of all shots. Here’re the details: With VR=ON (in camera) the combo produced results down to 1/5 sec (4 stops) which were better or at least comparable to 1/80 sec with VR=OFF. At 0.4 sec there were 30% clearly blurred images. This is a 4-5 stop advantage from stabilization. I also tested the Nikon 24-70mm f2.8E VR via the FTZ adapter on the Z7. In earlier tests on a D810 the lens produced a 3-4 stop advantage from its built-in VR and I was curious how a stabilized F-mount lens profits from the additional roll compensation that the Z7 body provides in a test set-up that was identical to the one above. The results: The image stabilization was slightly better than from the Z 24-70mm f4S + Z7 combo down to 1/10 sec (3 stops) but had 20% misses at 1/5 sec and 60% misses at 0.4 sec. This is a 3-4 stop advantage from stabilization. That may not seem better than from my earlier test on the D810 but on the Z7 the results were very sharp down to 1/10 sec more consistently than on the D810. It looks like the additional roll compensation from the Z7 has a positive effect on the image stabilization of adapted F-lenses. Next check out my quality results!